The problems mount up for the smart meter roll out. More than a million households may be unable to benefit from the new breed of fully switchable smart meters, it has emerged. 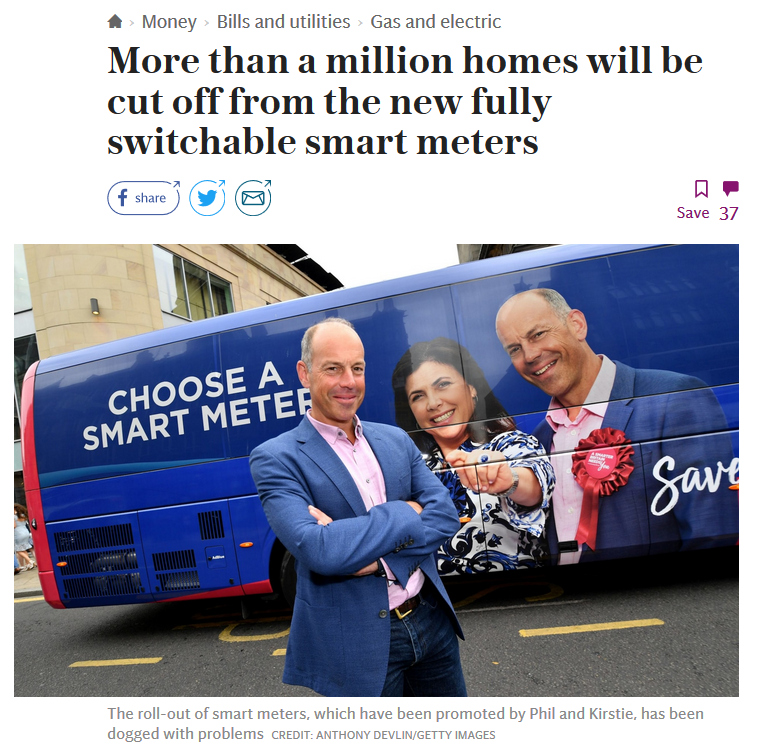 The £11bn smart meter roll-out, promoted by celebrities including Kirstie Allsopp has seen more than 12 million installed, but has been dogged by issues of meters “going dumb” and losing their smart functions when a customer switches energy supplier. Switching remains the best way to reduce energy bills. Customers with smart meters can switch, but they will typically lose the “smart” benefits. The new generation of meters is supposed to connect to a centralised network accessible by all suppliers, fixing the problem. But Telegraph Money has learned that dozens of suppliers are not yet full members of the network, meaning their customers will not receive fully functioning meters. The news comes just a week before the date at which suppliers must stop installing first-generation smart meters, and is another blow to the Government’s flagship clean energy policy, which was heavily criticised last week by spending watchdogs. She added that the energy regulator, Ofgem, should do more to make sure consumers benefit from smart meters, and called on it to reveal the names of the suppliers yet to sign up. Firms go through several testing stages before they can become full members of the network, operated by the Data Communications Company (DCC), a part of Capita, a process that can take months. Ofgem said it would consider enforcement action against suppliers not yet signed up. A spokesman for the DCC said 95pc of consumers are with suppliers capable of installing second-generation meters. That leaves roughly 1.3 million households that risk missing out. Times change and follies change. Hundreds of years ago the church spent billions in today’s money building the likes of Bath cathedral, York minster etc. There must of been the likes of you Paul sniping at that expense then. Now look at them, majestic things of beauty and awe. A true legacy of achievement. Are you trying to tell us that this current expenditure of billions on smart meters won’t be recognised in such a way in the future? How on earth can you compare a bit of an electric filled boxs to a cathedral ? I note that Crapita is involved. I would avoid like the plague. Was just about to make the same comment! And, having all meter readings in one hub database? What can possibly go wrong? The people who hacked Mariott Hotels will be rubbing their hands in glee. I was just about to add the same complaint, Capita, what could go wrong besides everything! Oh, dear – is a (small) dose of reality finally sinking in? The rest of it trots out the usual bunk about how they are crucial in tackling climate change, how 8 out of 10 smart meter owners have taken steps to reduce their energy usage. No mention of NON smart meter owners, like me, who have made dramatic reductions without one! Smart consumers refuse smart meters. Yes, smart meters are for dumb consumers. Quite possibly related to this chaos is the steady stream of “suppliers” going bust, though in essence all they do is deal with bill payments, nothing at all to do with electricity generation. Electricity bills are the new stealth tax, with everyone paying for example for people who cannot or choose not to pay their bills. No wonder so many companies are going bust, and others are trying to exit the business, there has to be a danger that this murky bill-payment/stealth-tax system is at a … tipping point. Hinkley Point C (£1.5bn over budget and a year behind schedule, surprise surprise!). Probably a few more can be added. It might be worth keeping a running total as they are bound to be more. I have no idea quite how to quantify the cost of all these to the taxpayer (by stealth taxes like increased fuel bills) but I’m certain it’s a lot. Will UK governments never learn they are simply crap at choosing winners. As useful as a one legged man in an arse kicking competition. I think there will be a use for EVs, or similar, in urban settings. Likely not in the manner now being “sold” via TV and slick print media. The major problem is the already-built urban infrastructure of large dense cores, the massive road network, and the many medium and low density living (apartments, homes) situations. Unseen, mostly, is the infrastructure supporting this — water mains with supply and treatment, sewers, electric lines, and the legal rights supporting it all. I wouldn’t include diesel cars in that list. Yes there were small tax incentives to promote diesel cars because they produce slightly less CO2 than petrol cars do. But the recent casting of them as evil polluters is based on spurious evidence. I switched to diesel cars for the fuel economy and, at first, I was prepared to put up with the slow acceleration. Now I don’t have that problem as modern diesels have excellent performance as well as being fuel efficient. Not sure whether you think being in Galileo or out as a result of Brexit is a bad thing? Whichever we’ve now decided to go our own way which will also end in trillions wasted and nothing produced. Galileo was always an unnecessary waste. We have all the GPS we need via – yes – GPS. The french pushed galileo because they said we couldnt trust the USA and must have a Euro duplication. NATO was asked to part fund this duplication but said No, as it was a waste of money. UK vote in NATO was No to galileo waste. However EU (being french controlled) pushed this waste of money anyway and thus sucked in UK money via the EU wastemachine. Galileo is waste and will provide nothing we dont already get via our closer and more trusted USA partners. Remember we share far more secrets with the USA than any EU nation. We trust the USA (and Canada and Aus) more than the EU nations. So why arnt we in a union with our better friends? Why do we discriminate against our best friends? Why can an Austrian live in UK by right but an Australian (of UK ancestry) cant? There are ideal uses for EV’s under current conditions, they make fantastic milk floats. But the UK is having them mandated from 2040 utterly ignoring market forces. That’s potentially (probably) a massive fail. Diesel cars were thrust down the throats of businesses with a variety of incentives to demonstrate that under the CCA Britain was a world leader in CO2 reduction. Our government was so obsessed with CO2 they utterly neglected to consider there was anything else harmful about them. Yet a modest pharmacist could probably have told them they were barking up the wrong tree. They are now determined to demonstrate their long term commitment to atmospheric CO2 reduction by compelling us all to drive EV’s by 2040; and guess what, those entirely imaginary statistics of the UK being transport CO2 free, will be stitched into future projections to whip the greens into a frothing frenzy to ensure it happens. The UK paid a substantial amount into Galileo yet TM has managed to negotiate a deal with Europe that excludes us from using it militarily or in any other meaningful way other than Sat Nav. My point is that whatever technology our government (and most others) touch turns to a turd in the taxpayers hand. What’s worse is that governments working hand in glove with business to deliver profitable endeavours is a model for fascism. Deliberate or not, it’s precisely what the EU is doing; and what Hitler & Mussolini wanted to do. If I saw these two, Allsopp and Spencer, looking my way, I’d grab my wallet and run. John, me too. The Honourable Kirstie Allsop, daughter of Charles Henry Allsopp, 6th Baron Hindlip, has no right to lecture me on how to save money! Phil Spencer was head boy of Uppingham school in his time, so his parents weren’t short of a bob or two either. But, lest I seem anti-elitist and left wing, I think it mainly boils down to not really liking or trusting either of them from their TV personas. For me these were not the two to convince me to buy in. On topic, I have a smart meter, which was in the house when I moved in – I changed suppliers partly to make it go dumb. The previous owner took the display with her (err, why?) I never asked for it back. I suspect I’m not alone. My tactic is to wait for a very long time and not do anything while everyone else is jumping onto the band wagon and screaming for it to stop. So many thanks for this news. Also I’d like to add that a shortage of something and a terrible danger that “you can’t have something that the people next door can have” is only a selling technique to force you into something that Somebody Else will profit from. I have many friends with smart meters. Without exclusion their devices are now sitting in some dark corner of the house utterly ignored, if they are working at all. The motto of the whole saga is, that if you are in your house in the middle of winter without a jumper on, you’re using far too much energy to heat your house to tropical levels. And yes, our friends and relatives come prepared when they visit us, with coats and jumpers. Sorry HotScot, but if the Consumer can afford it and is comfortable it does not matter what temperature they run their house at. What smart meter benefits are there? No more on-site meter readings, in theory. The State of Victoria, Australia, told people 5-10 years ago that smart meters were to be a compulsory purchase by householders. They never proved they had the ability to make it compulsory, so it is likely it was a bluff. The uptake was about 90%, IIRC, depending bureaucratically as usual, on how you define the ingredients of the claim. The dozen other householders in our unit block have smart meters. I am still thinking about getting one. The other householders do not benefit from active use of their meters to tell them how their consumption and prices vary over the day. I know this for sure because the meters are locked behind a steel panel and only I have a key, created with the help of an amateur locksmith. Who has benefited from Victoria’s domestic smart meters? The leftist State government has gained several virtue signalling topics. Those groups who bought meters from overseas and sold them to the public presumably made a quid or two. However, this was not a normal buy-sell deal done with known prices. The parties to the deal have, to my knowledge, never disclosed meter purchase and sell prices to the public, who were left with a ‘mandatory’ instruction to buy a meter for an undisclosed price and pay for it opaquely through their regular electricity accounts. They had no choice as to brand, no competitive shopping around, nothing like that. After a lot of tnking, I can see absolutely no public benefit from the deal, I can see some compulsory public loss. Why on Earth has Britain not looked at hostoric examples like Victoria’s and concluded the obvious? It would be impolite of me to mention ‘scam’. Geoff. “Why on Earth has Britain not looked at historic examples like Victoria’s and concluded the obvious?” … because smart meters are an EU directive, and because the relevant govt department has been taken over by the Green Blob. Thanks, climaterecon, I thought it was bad with vacuum cleaner power and the EUand the like, but I thought Brexit was voted “Exit” and GB would be back on the path of self-managed efficiency. I shall have to take this into account next time I don’t visit. Geoff. I was asked if I would have a Smart Meter, which I refused because of the problems that have been raised. Also they are costly. More research needs to be done before I think about getting one. Also I don’t like using a card or a payment key on a gas meter as it’s not safe. The meters are prone to leaking also, each company can’t promise me that they will provide a monthly or quarterly bill. So unless you come up with a reliable service, no thanks. Over the last two weeks ScottishPower have sent me about six emails inviting me to have a smart meter installed. This is the first time they’ve pestered me. It couldn’t be could it that they have a stock of first generation meters they want to foist on people before the deadline. I don’t know that is what they are doing but the timing looks suspicious. At the risk of duplicating comments above, there is only one reason for smart meters. They are concerned with demand management – finding a way to discourage the use of electricity at times of high demand, when there is a danger of blackouts. So at those times the unit charge goes up, and we decide to reschedule anything that is not essential. Hence no blackouts, as we are so close to the limit of our electricity production and things will get worse the more we rely on intermittent supply from wind, solar and tides. If domestic demand is curtailed voluntarily because of price, then we, the people, will not have to pay millions to those with standby diesel generators, designed to fill the gaps in supply. And that will only cost us £11 billion, added to our charges for electricity already, so quite a bargain, don’t you think? There’s a lot of stuff on YouTube about smart meters causing cancer and other illnesses. I sure don’t want one. Some contractors were installing one across the road and tried to get me to have one installed. That’ll be over my dead body I told them. I would like to find a way to change the opening mechanism on my meter boxes so that I can lock it to prevent anyone installing a smart meter when I’m not at home. On the other hand, maybe getting a first generation smart meter is a good idea and then make it go dumb. How do they work ? Do they need the householders WiFi ? smart energy technology can be useful, and cost effective. I have installed “Hive” on my gas fired heating and it is proving to be really good, and only cost £135. I used to forget to turn the heating off when I went out, I still forget but now do it from my mobile when out. I then turn it back on on my way home. Saving me a fortune. I have no idea what the point of a smart meter is.